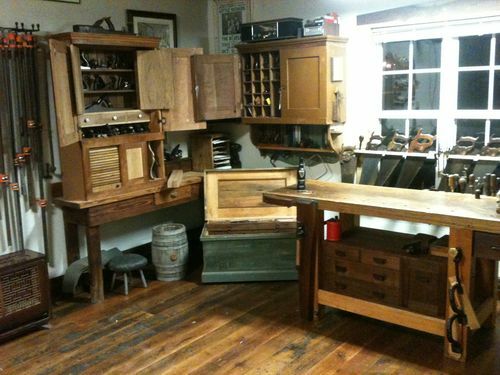 This thread is a continuation of our original work bench smack down thread. After 18428 replies to the original, we needed a fresh start. First post. Looking like I need to build a bench this spring. Not sure if I’ll do a Roubo or a shaker style. Should have all the wood needed for the base already, and debating what to do for the top. What kind of hardware you going to use, Jmart? Maybe I can stop by and give you a hand with the heavy lifting. 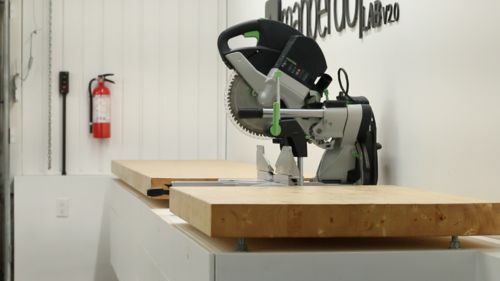 I’m 2.5yrs into my workbench build – 2 kids, moving to a new house and finally acquired some decent panel saws and bits/brace to finish assembly. Glued up a 2×6 with a 2×4 section for the top and totally screwed up the gluing so now I need to level off the upwards warp. 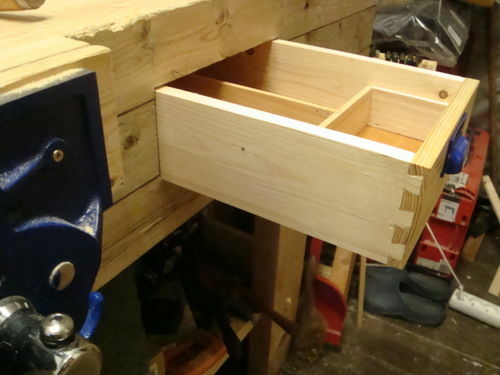 Started to hand plane the warp out and lost patience and have since decided to create a router sled. Most likely the Lee Valley tail vise screws I had on my previous bench from my townhouse. Already have them. Might get a new handwheel for them, but we’ll see. I’d like to have benchcrafted, but the budget won’t be allowing that since I have a kid on the way. 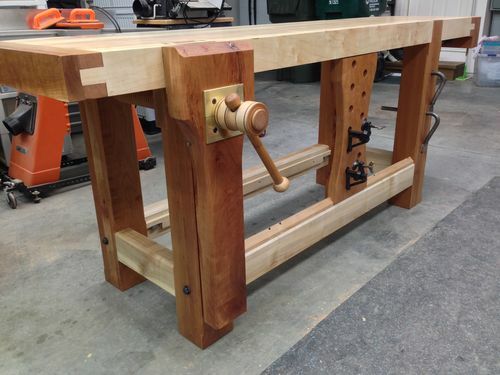 Leg vise with the classic peg board, and a wagon vise. Dibs on first bench pic!! Beautiful work. I really want to tackle one of these soon. 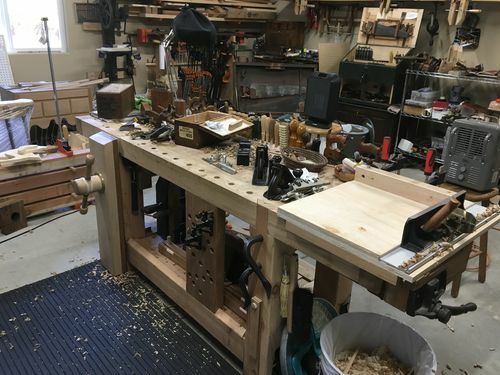 My bench is a little different then what has been posted previously. This video provides a little overview. Bench pics? No problem, but it’s not a new one (bench or pic). These pics are from November 2013 (has it been that long?!). Gonna be a fun thread, lots of pics hopefully, and ideas. I am leaning toward the “simple bench” for a number of reasons. The thing I would miss most with your style of bench is something to limit length of cut, for repetitive cuts. I recently had seen 2 videos that address this on a simple bench. I am leaning toward the second guys way of doing it. 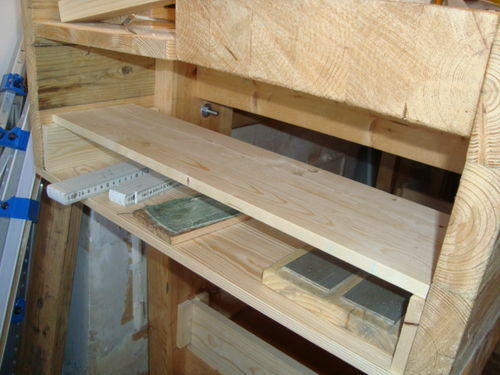 When I need to make repetitive cuts I use a similar method to the second guy, I just clamp a piece of wood to the bench. If your mitre saw won’t be out 100% of the time then his block method is definitely the way I would go. Made with recycled wood except the tool well, shelf and drawer. 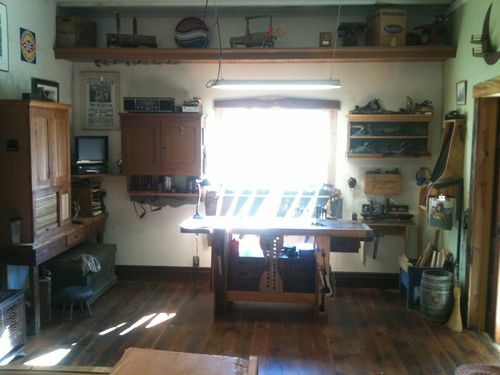 It is a “Paul Sellers” workbench type. - there is an extensive set of video’s showing how to build it. 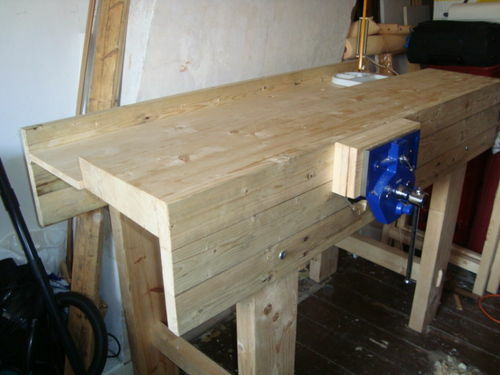 So i’m in the process of researching to build another bench, the first one was more of an assembly table with a vise on it. 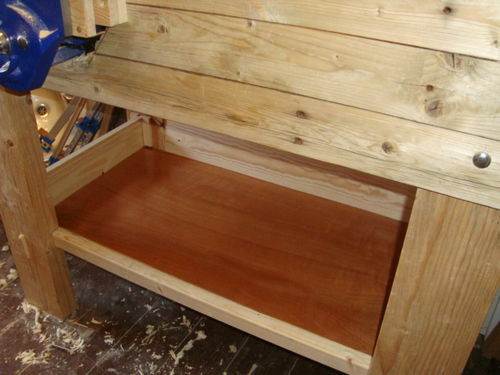 This time I am looking to do a SYP Roubo style bench and one of the parts that has me pondering so far is how to cut the joinery for the dovetails on the legs to attach to the top. Does anyone have a good tutorial or blog that shows the best way to go about cutting this? Notw – one of the Schwarz books has a Roubo build from laminated SYP and he covers it. Basically, IIRC, you cut the joinery pieces individually then glue them together to create the DT/mortise joint. I was lazy on my build and skipped that and just went with M&Ts so I can’t give you any better advice.